Right on time at 6:00 we started moving. I saw many familiar faces and managed to get in just behind the leading group across the Golden Gate Bridge. 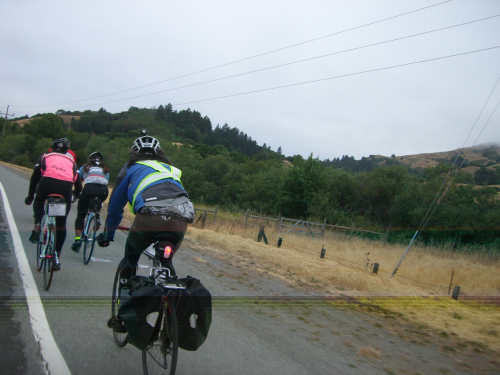 At the Camino Alto climb the group stayed mostly together and we continued like that to Fairfax. I was feeling just ok, not great but not bad. Again on the next climb, White Hill, i manage to ride close to a group that would pull me all the way to the bottom of the next climb, the Olema hill. By now I was not feeling that well and I slowed down and just let the group go. On Pt Reyes Station I went to Toby's for an espresso and saw Steffen P and Erick W my Fleche pals earlier this year. Toby's did not have register receipts but the lady hand wrote one for each of us. Caffeinated now it was time to get some water at the public restrooms on the back of the building. As I was getting ready to leave, a group of riders was coming in. Greg B, who would be driving back with me to San Francisco the same evening was there and we left together but at the first tiny incline I just slowed down and felt the early signs of cramps. Ah crap, it is too early for this! Maintaing a steady pace without ever pushing, I made it to Valley Ford. This was not a scheduled stop but I needed to get some electrolytes into my system and allow the legs to recover a little. There was a bicycle tourer and we started chatting about his trip and my ride. As I was preparing to leave Andrea and Francisco showed up. We saw a few of riders doing the ride go by and when I was rolling Jesse M and Matthew F passed and I jump on the tandem they were following. 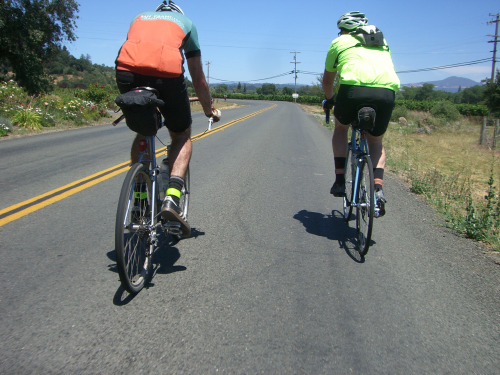 A little better but not quite there, I rode with them a few miles to the bottom of the Occidental climb. Again I had to slow down to prevent cramps but my pace was not supper slow so I figured I would be OK for the rest of the ride as long as I managed to eat and rest from time to time. I had been drinking plenty of water from the start I was sure the culprit was the wine and beer I drank early on the week. Nobody passed me on the way to Guernville the next Control. This was an "open" ControI meaning a receipt from any retailer in town would do. I chose Safeway as my stop, I like their soup bar, chili with chicken for me today. Greg was also at Safeway and decided he had enough fun for the day riding with the lead group and he would ride with me the rest of the way. After a thirty minute lunch break we were ready to leave. Sun was out and the temperature was still pleasant. 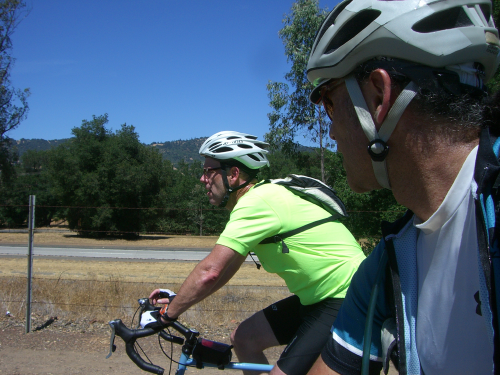 A few miles after getting off Hwy 116/River Road Steffan P, Eric W and Roy R joined us. They were doing the 300k route which had a slightly different route than our 200k. We talked all the way till it was time for us take West Dry Creek Rd. Sun was now much warmer but there was a nice breeze and our pace was not fast. The next Control was at the Dry Creek General Store. Matthew, Jesse and the tandem where there as were Andrea and Francisco. We got something to eat and drink and sat on the porch to eat or stuff. Once again as we were leaving another group of riders was coming in. Willy N, Deb B and many others went straight to the bar next door. We would wait till the end to get a beer. It was hot now. With the first pedal stokes came a very sharp pain on my left knee. This ha also happened right after leaving the Guernville Control. And also happened on the 600k earlier on the year. However after pedaling while standing for a little bit things got better. 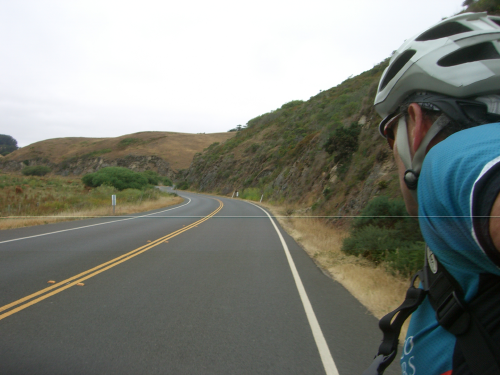 We followed the route taking the long way to Cloverdale. At Asti Rd I wished I had remember to soak my cycle cap in water, the sun was strong and the temperature had increased considerably. Fortunately Cloverdale was just a few miles away. Entering town we commented we were happy we weren't doing the 300k today. However that last Control was on the other end of town and it we still had to pedal there. When we got there the same six or so riders we had seen in Dry creek where there, my final control receipt was printed at 3:10pm. We joined other riders on the sidewalk and then slowly but surely they left towards the Best Western Motel. We left last and then meet them at the motel were we sign in the list of finishing riders and turned in the completed brevet cards. A beer in hand and a few salty chips I was happy. I got my drop bag and pulled out my towel and toiletries and with Bruce's approval used the shower in the room where the finishing riders checkin was happening. Now with clean clothes I was even happier. It was now a matter of waiting for the wife to come and pick us up. We were going to have dinner at Ruth McGowan's Brewpub in quiet downtown Cloverdale. During this year's Fleche my team had dinner there and I liked their food and as a bonus the beer was OK.
Said our goodbyes and let a few riders we were headed to the pub. Just a few minutes after we sat at our table riders started coming in. After having a beer and a burger, at about 8pm, it was my turn to drive us home to San Francisco. I'm still feeling rando-burned out, I'm taking more time off from randonneuring and just do some short trail running (4-8 miles) and also mixed terrain riding exploration. Nice riding with you for a while on this brevet. Sorry you are feeling burned out on Randonneuring. If you want some company on a short local mixed-terrain ride, let me know; those are my favorite rides. I crashed on my ride back from Cloverdale (hit a rock in the road near Whites Hill) and now have to take it easy for a while to let my knee heal.